I’m not big on ghosts and goblins, so to celebrate Halloween I though I’d include a few recent images of spiders that I have not posted previously. Some of my readers may find certain spiders to be creepy and utterly appropriate for Halloween, though I tend to view as beautiful creatures, many of which are capable of creating beautiful web art. NOTE: If you click on any one of the images in the mosaic, you will be taken into slide show mode, where you will see larger versions of the images (when you are viewing the original posting). Even from a distance it’s hard to miss the bright lapis blue eyes of a male Great Spreadwing damselfly (Archilestes grandis). Unlike many damselflies, which are tiny, this species, as its name suggests, is a big damselfly, about 2 to 2 1/2 inches in length (50-62mm). 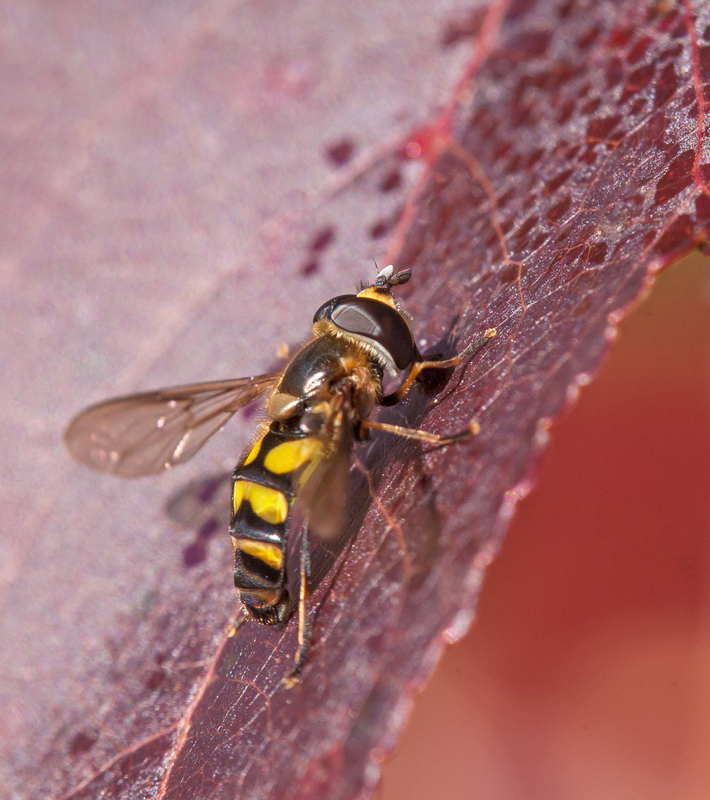 According to Bugguide.net, though, the bright yellow”racing” stripe, which occurs on both males and females, is the most easily seen distinguishing identification feature for this species. I had never even heard of this beauty until the 11th of October, when fellow dragonfly hunter Walter Sanford blogged about his discovery of one at Huntley Meadows Park on the 9th of October. I had no idea if this was the only member of the species at the park or how long it would hang around and didn’t hold much hope of seeing one of these damselflies myself. 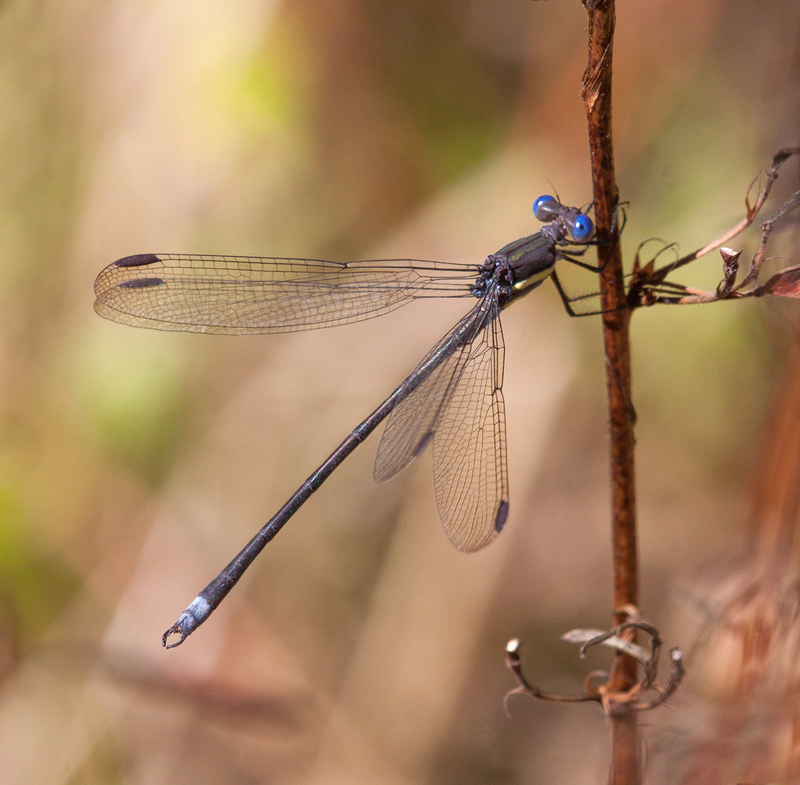 I was shocked and pleased on the 20th of October when I spotted Walter and this damselfly. Walter graciously ceded to me the prime spot for taking a close-up shot. A week later I returned to the same location and the Great Spreadwing was gone. In past years I didn’t pay much attention to the timing and location of various dragonflies and damselflies—they were either present or they weren’t. This summer and fall, however, I’ve been learning how important the specific habitat and the time of year are for certain species and the window of opportunity to observe them opens and closes pretty quickly. Consequently, I consider myself very fortunate that I was able to capture this little portrait of the Great Spreadwing damselfly. It’s hard enough to find the stunningly beautiful Blue-faced Meadowhawk dragonfly, but fellow photographer Walter Sanford set the bar higher this season by seeking to capture them against a backdrop of colorful autumn foliage. Check out his amazing results. 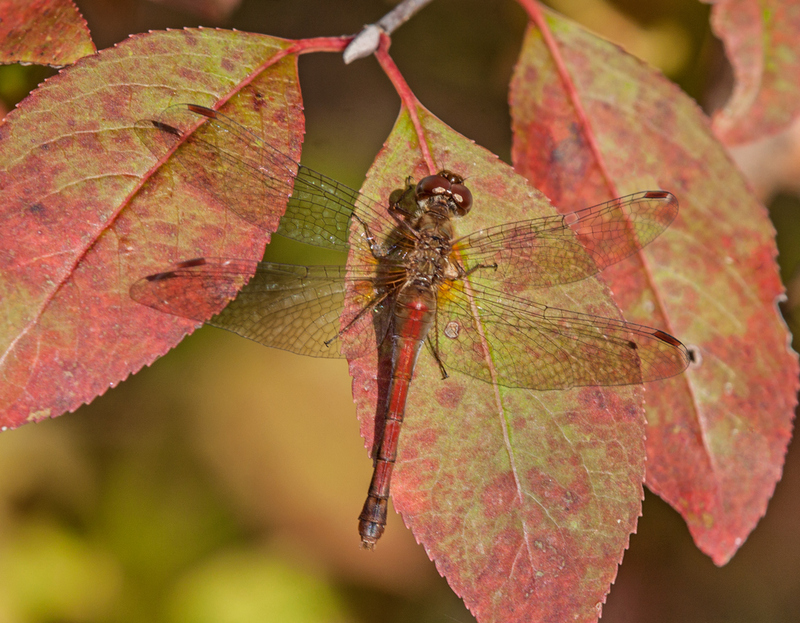 This is Part 1 in a series of posts featuring photos of Blue-faced Meadowhawk dragonflies (Sympetrum ambiguum) spotted while photowalking Huntley Meadows Park during Fall 2014. All individuals are males, as indicated by their coloration and terminal appendages. One of my overarching goals this fall is to shoot pictures of my favorite species of dragonfly against a background of autumn foliage. The color and clarity of these photographs is enhanced by using an external flash unit to add “fill” light. As the days grow colder, I am trying to capture images of almost any insect that I can find. I was particularly happy this weekend when I came across this little flower fly (also called a hoverfly or syrphid fly) on a beautiful reddish-purple leaf. The leaf made for a simple backdrop that lets you see some of the details of the fly’s body, including the incredible compound eyes and the antennae. I was also pleased that the out-of-focus area behind the lead is a orange-red color that seems appropriate for this autumn season. Many of the other dragonflies are gone for the season, but the Autumn Meadowhawks (Sympetrum vicinum) will be around for quite some time, possibly even into December. Autumn Meadowhawks like to perch on the ground much of the time, but yesterday I was happy to capture one in what I consider to be its natural environment, perched among the colorful leaves of the autumn foliage. 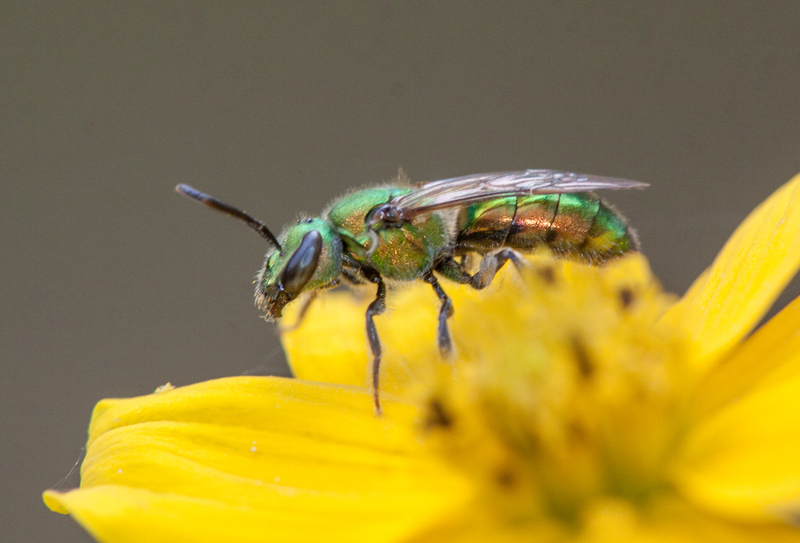 The calendar indicates that we are well into autumn, but this metallic green sweat bee (genus Agapostemon) that I observed on Friday at Huntley Meadows Park was busily gathering pollen as though it were spring. With eyes that look like a mask, it looks like he decided to dress us as a Teenage Mutant Ninja Turtle for Halloween. This re-posting is a bit of shameless self-promotion, but it is hard to describe how honored and thrilled I feel to be featured by Leanne Cole in a blog posting today. Leanne, who lives and works in Australia, is a wonderful photographer who spends a lot of time as a kind of photographic evangelist, sharing her passion for the art and practice of photography. She is constantly encouraging and teaching others, yet somehow seems to find time to explore new areas of her own photography, ranging from photographing the stars at night to investigating the close-up world of macro photography. Be sure to check out her incredible blog.